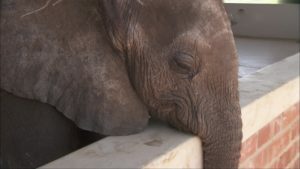 Ellie was a baby elephant who was cast away by his herd. 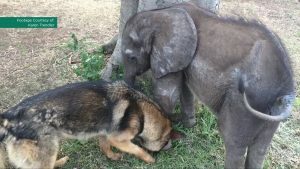 He was found by caretakers of the Vindum Blue Thula Thula Rhino Orphanage when they were doing their rounds to ward off poachers at the Hluhluwe-Umfolozi Game Reserve. 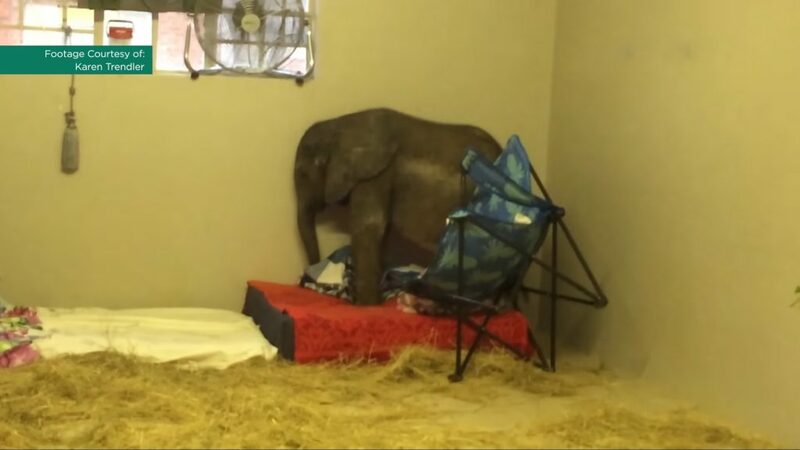 The caretakers tried many times to get the little elephant reunited with his herd. But every attempt was unsuccessful. The herd simply wouldn’t have him. Elephants are highly social. Being evicted from the herd is among the worst things that can happen to an elephant. But for Ellie being evicted meant certain death. He was far too young to survive by himself. It was hard decision for the people of the Vindum Blue Thula Thula Rhino Orphanage. They couldn’t just leave him to die, so they decided to take him in. When they took Ellie back to the orphanage they found that he was very sick. Ellie had an umbilical hernia. On top of that, it was abscessed. Basically the umbilical area was open and terribly infected. This area is in direct connection with the blood supply. The prognosis for these type of injuries is rather grim. Only about 1% recover from the infection and survive. 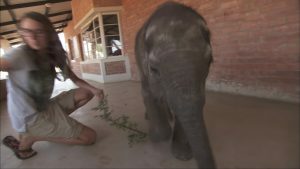 The vets and the personnel of the orphanage nursed the baby elephant 24hrs a day for over 3 weeks. The effort paid off because the infection subsided and Ellie begun showing signs of improvement. There were bad news unfortunately. It seemed the infection left a very undesirable side effect. Eddie, no longer tolerated milk. The vets sent for different formulations given to elephants in other institutions all over Africa. They received elephant milk from Zimbawe and Kenya. Ellie didn’t tolerate either. Ellie was still a baby elephant and without milk he would perish in a matter of days. Impotence began to show its ugly face. Having tried the most popular formulations for elephant calves used across Africa without success, they ran out of choices. Someone in the team suggested they could try to make their own formula. With no other choice left, they put their minds and hearts into the new formulation. 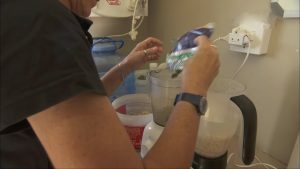 The ingredients chosen were rice -very well cooked- protein powder, minerals, coconut oil and dessicated coconut. Unusual, but it would have to do. They begun feeding Ellie this new “milk” little by little. It worked. In the beginning he didn’t take much but at least he took some. As time passed, he began taking more and more, until he was taking the required amount for his weight. Ellie’s physical health improved dramatically. He was gaining weight. You would say there was nothing to worry about anymore but you’d be wrong. 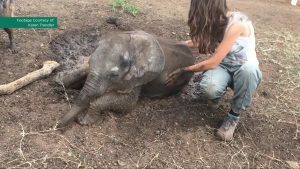 He was physically doing great but there was no denying that being separated from his herd at such a young age had been devastating for the little elephant. Sadness overtook him and it was as if he didn’t want to live anymore. It was heatbreaking to witness. There were no other elephants at Vindum Blue Thula Thula Rhino Orphanage. Their main objective was to rescue rhinos from poachers and in between they managed to help other animals as well. 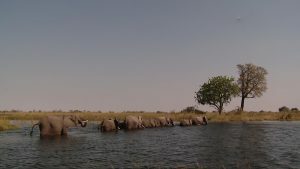 They had rhinos, hyenas and crocodiles among other species but nothing remotely similar to elephants. They tried to socialize Ellie with other animals but he didn’t show any interest. As a last resort they introduced Ellie to a German Shepherd named Duma. Duma had been a working dog most of his life. He was now retired from the South African Police Force and was spending his last remaining years in the rhino orphanage. His life contrasted a lot with Ellie’s who had been born rather recently and had only experienced the world briefly with his herd and now at the orphanage. They were both taken to a mound of dirt and left to their own devices. 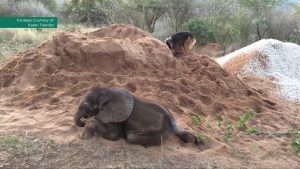 Duma begun digging holes on the mound with his front paws and Ellie played with the dirt using his trunk. Despite their obvious difference it was perhaps the love of dirt that brought them together but after that moment they would come to be inseparable friends. Duma was an experienced canine police officer and he knew from the beginning that Ellie despite his size was just a rookie. Duma took the role of the father Ellie didn’t have and it was curious to see them having fun because in all their games Duma always seemed to be looking out for Ellie. When they went on walks Ellie would walk impetuously and Duma would follow going back and forth. Sometimes he would grab sticks and hand them to Ellie who would take them with his trunk and play around with them. Ellie’s improvement was radical. He seemed happy and fulfilled. Patched up, so what now? The purpose of Ellie’s rescue had always been to reintroduce him to another herd. His injuries made it impossible at first but his radical improvement and his friendship with Duma made everyone happy. 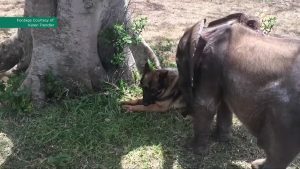 There was something heart-warming about an elephant and a German Shepherd playing games. Everyone at the orphanage was in high spirits. One morning Duma’s barking drew the attention of everyone at the orphanage. There was something odd about the way he was barking. When they found him, Ellie laid collapsed on the ground right next to him. He had been calling them to help his friend. It wasn’t many hours after Ellie’s collapse that he suffered massive organ failure. Ellie died shortly afterwards. A profound sadness overtook every single human being at the orphanage. She was laid to rest in a grave dug at the Hluhluwe-Umfolozi Game Reserve. Duma, the German Shepherd, tries to carry on with his life as best he can. Next Story → Your Favorite Country Singers: Who are they married to?